Monastery may have served as center for pilgrimages, expert says. The remains of a 1,500-year-old monastery and church were discovered near Beit Shemesh. 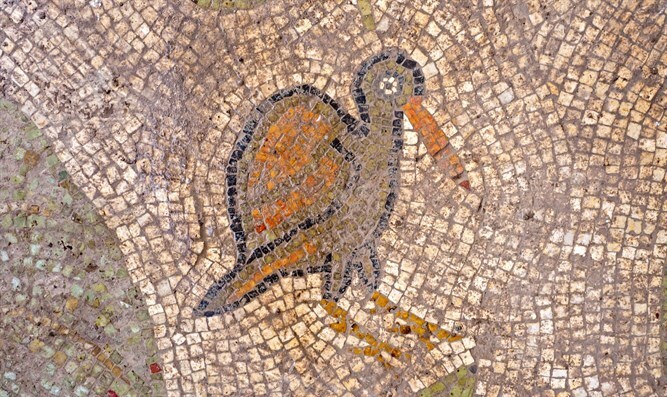 The Byzantine-era buildings, complete with mosaic floors and imported marble items, were discovered by over 1,000 students participating in an Israel Antiquities Authority (IAA) excavation in preparation for the construction of a new neighborhood in Ramat Beit Shemesh. Binyamin Storchen, who is leading the IAA excavation, said, "We were surprised by how well the findings were preserved, as well as by the wealth and beauty we discovered. This wealth may prove that the large building, which served as a monastery, was an important center, and it could be that it was one of the main pilgrimage centers in the Judean plain." "During the excavation, we uncovered the remains of walls made of smooth and expensive stones, as well as impressive architectural items. These were specially imported from Turkey, and were brought by wagon from the port. In one of the rooms, we discovered a gorgeous mosaic floor, decorated with the images of colorful birds, leaves, and pomegranates." The monastery was deserted in the seventh century CE, for unknown reasons. Only a small portion of it has been uncovered. Since the excavations began during the summer, over 1,000 youth from different programs have participated in the excavations. Most of the students study in pre-military academies. According to Hadas Keich, a 16-year-old high school student from the southern town of Sde Boker, "We were looking for a way to lower the costs of our trip to Poland, and decided to join the archaeological excavations. Slowly, we discovered fascinating findings, which connected me to history." Israeli high school students often travel to Poland, to visit the concentration camps and other Holocaust-related sites. In March, Israel Antiquities Authority Chairman Yisrael Hasson said, "The trip to Poland aims to raise students' awareness of our nation's history, and to strengthen their commitment and sense of mutual responsibility. It's no secret that the trip is expensive, and some parents have a difficult time funding it. "The Israel Antiquities Authority decided to work together with the Education Ministry to integrate Israeli youth into the archaeological excavations, and to reduce the cost of the trip to Poland. In this way, we're developing the students' connection to their heritage and their sense of commitment even before they leave for Poland."